Collection of time can be collecting working hours and also collecting memories. I made a windmill with printing matters which were brought by each one and which were reflected their memory. This work has a little nostalgia. In brief, my plan is installing windmills in primary schools as many as possible. I thought about it a long time ago but it was difficult to find a primary school to accept it. I nearly gave up and suddenly received lucky news from Ushiku-shi in Ibaraki Prefecture who had heard about my plan in somehow. The wind the same as before just went through a corridor. I feel like that the nostalgic atmosphere of the primary school building will come into me with the wind. There is no letter which actually delivered with the wind as we all know. When I stepped in the site of the Onabake Primary School in Ushiku-shi, I touched the wind came through the corridor and I felt wrapped by some good old air and I enjoyed it for a while. When I placed a windmill instead of the wind, I think that the visual and material feeling could mix with reminiscence material feeling. Old newspaper could be useful sometime. For example, I use it for wrapping up something. It is strong and prevents from being eaten by worm. I put it back of the closet and sometimes forget about. When I found it at the housecleaning I stop cleaning and read the old newspaper of 5,6 years old in nostalgia. It’s just a newspaper but it will bring us back to the past. I thought about expressing those times in the past through workshops. The theme is “the wind”. The wind is a flow of air therefore it cannot be seen but feel. The word “wind” tends to be used in vague expressions e.g. “Catch the wind” and “Letter deliver by the wind”. The wind cannot be seen but it asserts its own existence. Some trembling flowers, falling leaves and dancing dust, those are done by the wind. If we think about the wind in that point of view, those, things we see, the space surround it, coldness we feel and even the smell delivered, could be all the installation which is expressed by the wind. The wind cannot be seen but can be sensed and therefore I would like to express the wind in a visible way. In short, I thought about creating a windmill as the sensor which read the wind. I used printed matters such as newspapers and magazines as a material for “kazaguruma” because those papers carry the information for those days with the changing background. Opposite to the “letters delivered by the wind” as in the same information processing system, it is the method to transfer information clearly and practically. 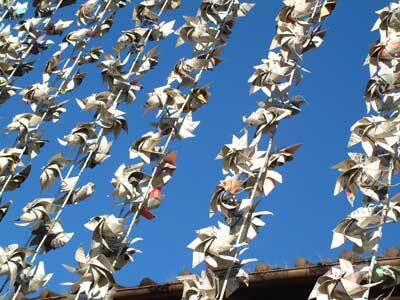 If “kazaguruma” is the sensor to read the wind, newspapers and magazines would be the sensor to read the days. If you decide the theme, you will have to decide the place to express next. You cannot see the wind but you can feel it. In arts, when you try to express the wind that is the intangible material, there would be the limit in the visual fact. You will also need the space. The reason I took this mean, the installation, is in there. When I take my express media “kazaguruma”, I chose the site of the primary school (onabake youth training facility) from nostalgic form. My work is the aggregation of the time, space and material and it is myself. We are all different as we have experienced different time and place. The people who attended my workshop brought newspapers and magazines. People brought different things and their memory is different. We use such a memory to create “kazaguruma”. And we connect those and make a wall of “kazaguruma” and we watch the wall which is turning around well against the hard wind and sometimes turning around slowly. What do you think about it? You should find yourself there reminiscing and you will become a part of the installation without notice.